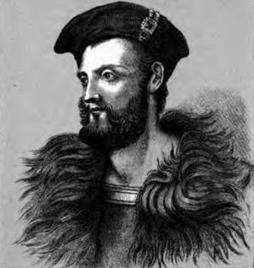 O’Neill was an Irish warlord who with the support of Spain rebelled against English rule. Romanticized in Irish history partly because of the poem written by Young Ireland founder Thomas Davis who wrote The Lament for Eoghan Ruadh O’Neill. Despite Davis’ reference to O’Neill being poisoned, there is no clear evidence as to how he died. The Lament for Eoghan Ruadh O’Neill. “May God wither up their hearts! May their blood cease to flow! “Though it break my heart to hear, say again the bitter words. And he died at Cloch Uachtar upon St. Leonard’s day. “Wail, wail ye for the Mighty One! Wail, wail ye for the Dead! Quench the hearth, and hold the breath–with ashes strew the head. How tenderly we loved him! How deeply we deplore! Holy Saviour! but to think we shall never see him more. “Sagest in the council was he, kindest in the hall! Sure we never won a battle–’twas Eoghan won them all. But he’s dead, but he’s dead, and ’tis slaves we’ll ever be. But–what, what are ye all to our darling who is gone? The Rudder of our Ship was he, our Castle’s corner stone! “Wail, wail him through the Island! Weep, weep for our pride! Would that on the battle-field our gallant chief had died! Weep for him, ye women–your Beautiful lies cold! Oh! why did you leave us, Eoghan? Why did you die? One of Ireland’s greatest ever soccer players, Johnny Giles is born in Dublin. His stature in the game is evidenced by the fact in 2003 he was a winner of UEFA’s Jubilee Award as the best Irish player of the past 50 years. The diminutive Giles (5 ft 7 in) was a magnificent footballer whose passing ability was legendary. 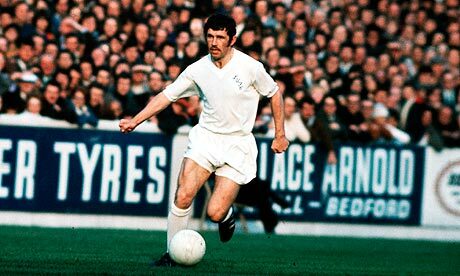 He was also tough as nails and some non-Irish (or non-Leeds United) supporters might even suggest he did not always play the ball! Originally discovered by legendary Manchester United scout Billy Behan, he signed for the Red Devils in 1957. Although he won an FA Cup medal with United in 1963, United manager Matt Busby failed to appreciate his talent and he was but a peripheral figure as the manager rebuilt a team decimated by the Munich air crash. Giles dropped down a division to sign for Leeds United in 1963 after which both he and Leeds grew in stature and success. Following a very successful playing career, Giles went on to manage Ireland and a number of clubs including West Brom Albion. The little fella can be seen regularly in RTE studios providing superb analysis of international and Premier League soccer. 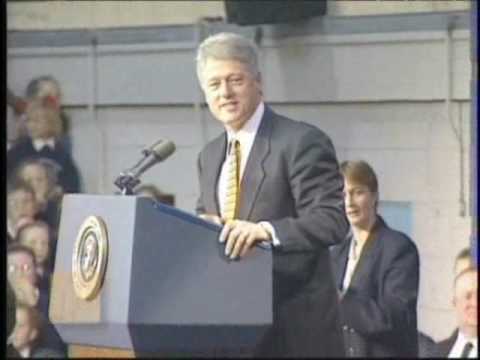 1996: Bill Clinton is re-elected President. Clinton does not have Irish heritage, but his presidency will likely be seen as one that had the greatest impact on Ireland. It is quite likely that the Northern Ireland peace process and the Good Friday agreement would never have happened without his cajoling and support. In Ireland (as it seems in so many other places), Bill Clinton is a rock star.